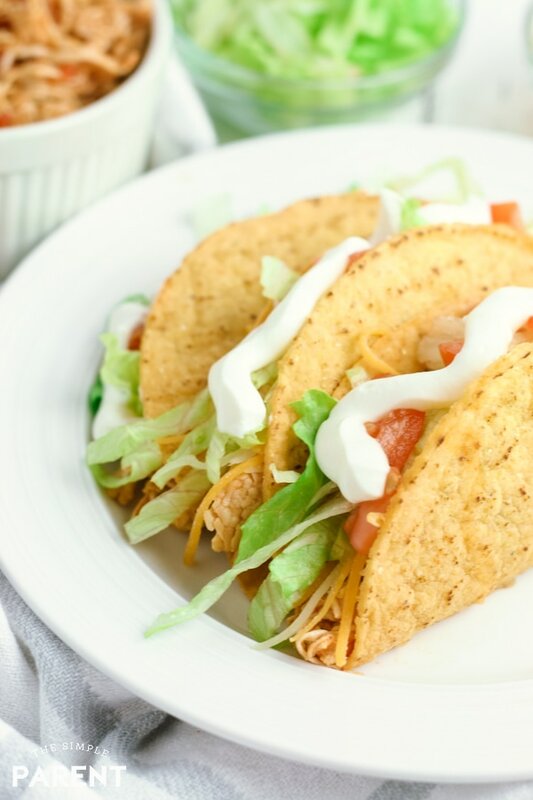 Home » recipes » Crockpot Chicken Tacos Make Dinner Oh So Easy! Crockpot Chicken Tacos Make Dinner Oh So Easy! Tuesdays are for tacos! 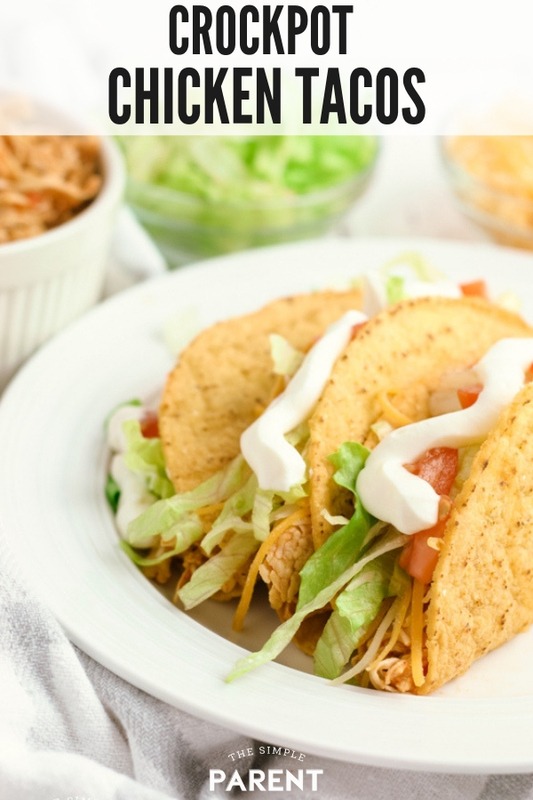 Even if you’re busy with all the things that your family’s life has on the calendar, you can still have delicious tacos at home by making Crockpot Chicken Tacos! 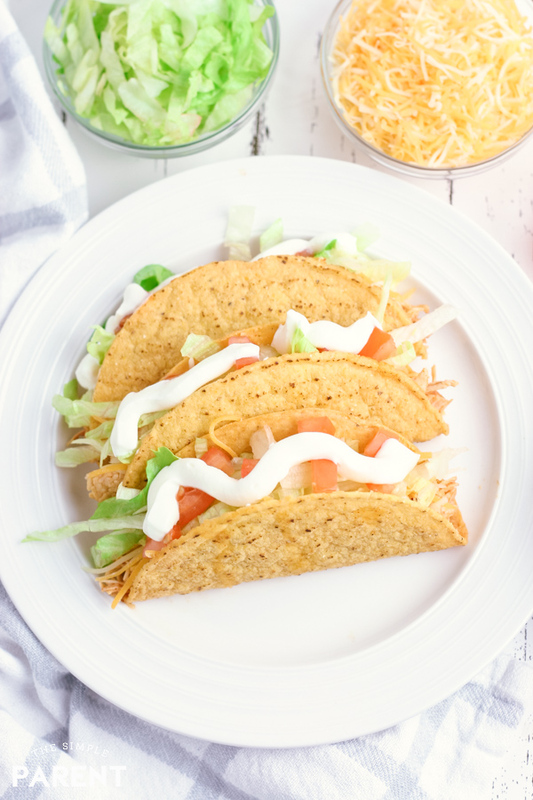 They’re easy to make and your kids can customize their taco toppings to make it a great family-friendly meal option you can enjoy any day of the week! If you have leftover chicken it also works great for other recipes like burritos and enchiladas! Or you can just enjoy the Crockpot taco meat on its own or in a lettuce wrap! It’s so good! When you make Crock Pot tacos, you get a lot of flexibility. 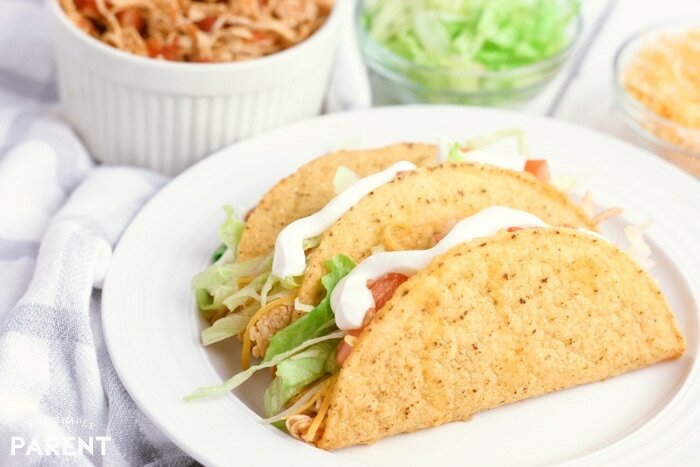 You can make them with different types of meat, but chicken tacos are one of my favorites just because I love chicken made in the slow cooker. It’s always so tender and juicy with tons of flavor! That’s true for these shredded chicken tacos! I’ve seen a lot of people make the filling for slow cooker chicken tacos with salsa. If you do that you’ll end up with tasty chicken, but I’ve found that I actually like using a combination of taco seasoning and diced tomatoes for a little bit of a pop when it comes to flavor. Without using salsa, you still have a very simple list of ingredients which makes this one of the easiest ways to make dinner! Here’s to Taco Tuesday! Instead of using salsa in our shredded chicken recipe, I use diced tomatoes with chilies. I’ve always liked the flavor and we usually have a can or two in our pantry so it works out well! This recipe makes 12 tacos so you can adjust the measurements if you need more tacos than that! 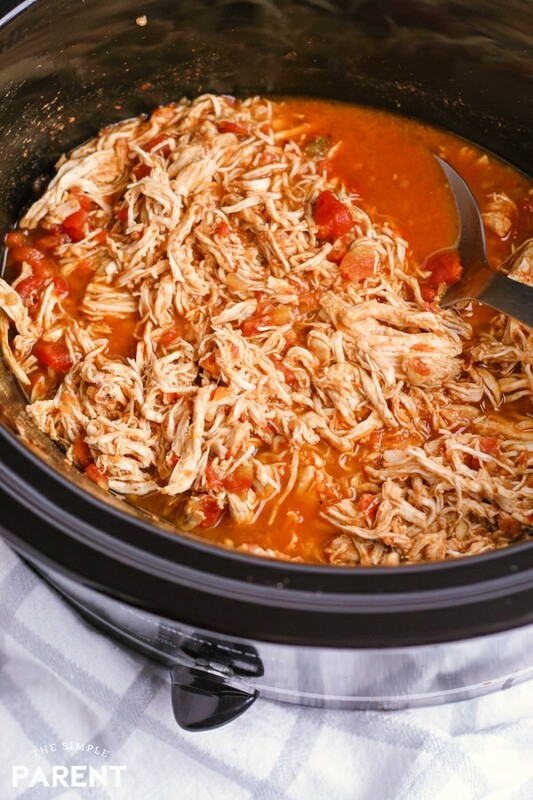 If you don’t need 12 tacos, the Crock Pot chicken taco meat is great as leftovers! So don’t worry about having too much! All you really need to make your own chicken tacos is your Crock Pot, but there are a few things that will make it easier! 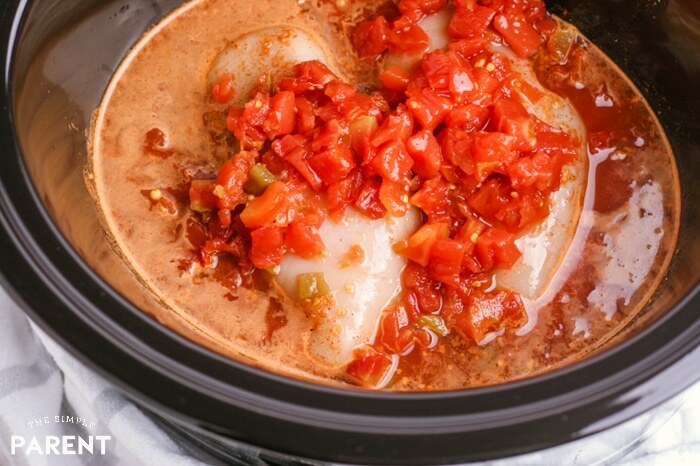 If you like easy cleanup, we always recommend Slow Cooker Liners! Once you’ve got all of your ingredients, this recipe is really a dump and go recipe. You will have to shred your chicken before serving, but otherwise, you can put everything in the Crock Pot and go do other things you need to do! 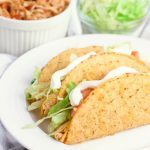 If you know how to make Crockpot Shredded Chicken, then you know how to make the chicken you need for slow cooker pulled chicken tacos! You got this! 1. Place chicken breasts in the pot of your Crock Pot. 2. In a large measuring cup, combine taco seasoning and water. Stir to mix then pour over the top of the chicken breasts. 3. Add the can of diced tomatoes with chilies over the top of the chicken and seasoning. 4. Cook chicken on LOW for 4 hours or HIGH for 2 hours. 5. Remove the chicken breasts and shred the chicken with a fork. It should pull apart easily. 6. Put the chicken back in the Crock Pot and stir to combine the chicken, seasoning, and tomatoes. 7. Prepare tacos by baking shells according to package instructions (if desired), chopping lettuce and tomatoes, and shredding cheese (if needed). 8. Build tacos by placing shredded chicken in the bottom of the shell, then top with lettuce, tomatoes, and cheese. Add your favorite taco toppings! These are great for Taco Tuesday, as an easy family meal, or for entertaining! Place chicken breasts in the pot of your Crock Pot. In a large measuring cup, combine taco seasoning and water. Stir to mix then pour over the top of the chicken breasts. Add the can of diced tomatoes with chilies over the top of the chicken and seasoning. Cook chicken on LOW for 4 hours or HIGH for 2 hours. Remove the chicken breasts and shred the chicken with a fork. It should pull apart easily. Put the chicken back in the Crock Pot and stir to combine the chicken, seasoning, and tomatoes. Prepare tacos by baking shells according to package instructions (if desired), chopping lettuce and tomatoes, and shredding cheese (if needed). Build tacos by placing shredded chicken in the bottom of the shell, then top with lettuce, tomatoes, and cheese. Add your favorite taco toppings! Can you make Crockpot Chicken Tacos with Rotel? Absolutely! Rotel is diced tomatoes with chiles so it works perfectly for this recipe! Can you use salsa instead of diced tomatoes? You definitely can. Instead of putting a can of diced tomatoes with chiles in with your chicken, substitute a jar of your favorite salsa. You also don’t need the water if you’re using a larger jar of salsa. You should have enough liquid. 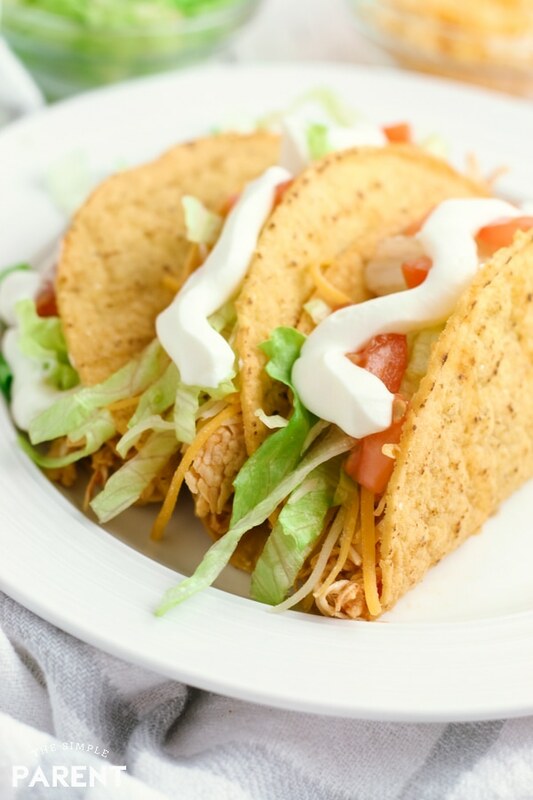 Can you make Crockpot Chicken Tacos with cream cheese? If you like your taco meat to have a creamier sauce, cream cheese is perfect! It’s the magic ingredient in our Crock Pot Cream Cheese Chicken Chili! For this recipe, you can add about 4 ounces of cream cheese to get a pretty creamy chicken mix. I’ve added a full 8 ounce package before and it worked out, it was just a little rich for our liking. But if you like Crack Chicken recipes, this is an addition you’d probably love for this recipe! Can you keep taco meat warm in a Crockpot? Absolutely! Just use the WARM or LOW setting on your slow cooker to keep your taco meat warm until you’re ready to serve. How much taco meat do you need per person? I generally plan an ounce of chicken per taco per person. This recipe makes approximately 12 ounces of shredded chicken which fills 12 taco shells well. COMMENT BELOW AND TELL US ABOUT YOUR FAVORITE TACO TOPPINGS! If you try this recipe and enjoy it, we’d love for you to leave a rating! All you have to do is click the stars by your comment box to let us know! We love 5 STAR ratings (obviously) and if you have any suggestions, we’d love to hear those too! I like ground beef, lettuce tomatoes, onions, cheese and hot salsa on my tacos. Shredded cheese, sour cream and guacamole. I like the usual – taco sauce, sour cream, shredded cheese & lettuce, chopped tomato! Lettuce, tomato, cheese, salsa and sour cream. That looks good! Depending upon who is here to eat with – the grandkids like things pretty simple: meat, lettuce, tomatoes, cheese and they LOVE avocado slices on the side! I like avocado and cheese. My favorite taco would be topped with black beans, diced tomato, salsa, shredded lettuce, and avocado. My favorite taco toppings are shredded cheddar cheese and tomatoes. My favorite taco toppings are the traditional lettuce, tomatoes, shredded sharp cheddar cheese, and sour cream. I like cheese, lettuce, tomatoes, sour cream and taco sauce. I like shredded lettuce, chopped tomatoes and onions, guacamole, shredded cheese and sour cream. I like cheese, lettuce, tomatoes and sour cream. I like lettuce, cheese, tomatoes, onions, black olives, sour cream, and taco sauce. That’s it. No spices, no gimmicks. My favorite toppings are lettuce, tomato, onion, cheese, sour cream and salsa. My favorite taco toppings are tomatoes, onion and avocado. I love shredded cheese, tomato, lettuce, and salsa. I like to add sour cream and cheese and lettuce. I love lettuce, avocado, and cheese on my tacos. I like lettuce, cheese, tomato & salsa. I love sour cream, lettuce, tomatoes, and Cholula on my tacos! For taco toppings I have to have jalapenos, onions, Rotel tomatoes for starters. My favorite taco toppings are cheese and lettuce. My favorite taco topping is sour cream. I always ask for more when I order at a restaurant. As long as it is topped with sour cream. I love chicken, peppers, tomatoes, lettuce, cheese, and sour cream! I like ground beef, lettuce, tomatoes, cheese, sour cream, black olives and medium salsa. I like to have avocado and sour cream. I love to top mine with pico de gallo, shredded cheese and sour cream. I like mine with cheese and sour cream. My favorite taco topping is cheese!!!! I like lettuce, tomatoes, sharp cheddar cheese, black olives, sour cream and spicy taco sauce. I love several, but one of my favorites is cheese. I love fresh shredded lettuce, tomato, cheese and homemade hot salsa on our taco’s! I like ground beef or chicken with lettuce and sharp cheddar cheese. It’s hard to pick a favorite! Sometimes I love bbq sauce on them. Sometimes I love sprinkling Locatelli cheese. I have two favorite taco toppings – sour cream and guacamole. My favorite taco toppings are tomatoes, cheese, and sour cream. I like cheese and lettuce on my tacos. favorite taco topping —> homemade Pico de Gallo !!! I love my tacos topped with cheese, guac, sour cream, lettuce, and Tapatio. I like veggies and guacamole. Salsa or guacamole and cheese!